Synthetic dyes comprise an important part of industrial water effluents that are discharged by many manufacturing industries. The impact of these dyes on the environment is a major concern because of the potentially carcinogenic properties of the chemicals . Also, some dyes can undergo anaerobic decolouration to form potential carcinogens . The wastewater which is coloured in the presence of these dyes can block both sunlight penetration and oxygen dissolution that are essential for aquatic life. Consequently, there is a considerable need to treat these coloured effluents before discharging them into various water bodies. Various approaches on handling and decontaminating such effluents have been reported in the literature. Typical techniques include the classical methods such as adsorption [3,4], coagulation [5,6], ion flotation  and sedimentation . All these techniques are versatile and useful, but they all end up in producing a secondary waste product that needs to be processed further. Another set of techniques that are relatively newer, more powerful, and very promising called Advanced Oxidation Processes (AOPs) has been developed and employed to treat dye-contaminated wastewater effluents . The semiconductor TiO2 nanoparticles has been widely utilised as a photocatalyst for inducing a series of reducetive and oxidative reactions on its surface. This is solely attributed to the distinct lone electron characteristic in its outer orbit. When photon energy (hv) of greater than or equal to the bandgap energy of TiO2 is illuminated onto its surface, usually 3.2 eV (anatase) or 3.0 eV (rutile), the lone electron will be photo-excited to the empty conduction band in femto seconds. The mechanism of the electron hole pair formation when the TiO2 particle is irradiated with adequate hv is depicted in Figure 1. Figure 1. Schematic diagram of an irradiated TiO2 semiconductor particle with photo-chemical and photo-physical process. 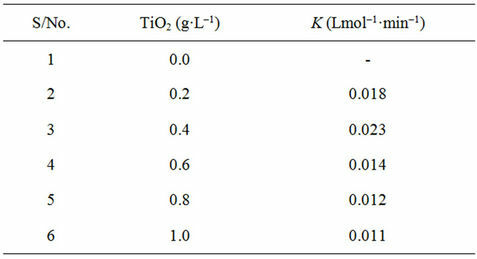 The energy band gap for TiO2 Degussa P-25, the most used photocatalyst, is around 3.2 eV (390 nm). Electrons and holes can recombine (Equation (2)) or react with other molecules, such as oxygen, generating reactive superoxide anions (Equation (3)). The positive holes can react with electron donors in the solution to produce hydroxyl radicals (Equations (4) and (5)) or would directly oxidise organic molecules (OM) at the semi-conductor surface (Equation (6)). The hydroxyl radicals generated in the process are strong oxidants and react quickly with the organic matter adsorbed on the catalyst (Equation (7)), forming oxidised intermediates, and if the treatment time is adequate, complete mineralization is achieved. The typical mechanism involving hydroxyl oxidative radical reactions go through the steps: electron transfer, hydrogen abstraction and addition to aromatic rings/ double bonds [9,10]. In many cases the macromolecule is completely mineralized into water and carbon dioxide. The AOP technique has drawn considerable attention from various quarters of scientific community as it is easy to handle and produces significantly less residuals as compared to the classical approaches. Amongst the many techniques employed in the AOP approach are the UV photolytic technique [15,16], Fenton process [17,18], photo-Fenton process [19,20], ozonation process , sonolysis [22,23], photocatalytic approach [24,25], biodegradation [26,27] and the radiation induced degradation of dyes [28,29]. Various physico-chemical techniques are available for the elimination of dyes from wastewater and in particular photocatalysis is a more promising tool. Moreover, photocatalysis can be used to cause redox transformations and decompose a dye molecule. The use of photosensitive semiconductors such as TiO2, ZnO, Fe2O3, CdS, ZnS and V2O5 has been reported in the literature for their use in reducing colour of the dye solutions owing to their environmental-friendly benefits in the saving of resources such as water, energy, chemicals, and other cleaning materials [30,31]. Titanium dioxide (TiO2) mediated based photodegradation has attracted extensive interest owing to its great advantages in the complete removal of organic pollutants from wastewater . This is mainly because of its various merits, such as optical-electronic properties, low-cost, chemical stability, and non-toxicity . The aim of the research, was to study the photocatalytic process using TiO2 nanoparticles in the form of slurry for the decolourization and mineralization of C. I. Basic Blue 41 (BB41). BB41, commercially called Cationic Blue GRL (C. I. 11105) is a reactive dye bearing an azo group as chromophore, with a molecular weight of 482.57 and molecular formula C20H26N4O6S2 manufactured by Dongwu Dyestuff Co. Ltd. China was obtained from a retail outlet. Titanium dioxide (Degussa P25) was utilized as a photocatalyst. Its main physical data are as follow: average primary particle size around 21 nm, purity ~99.5% and BET surface area 50 ± 15 m2/g. A UV-Vis Spectrophotometer, UV-1700 PharmaSpec, Shimadzu was used to determine the decolourization rate. The photocatalytic activities of the photocatalysts were performed in a 400 ml jacketed glass reactor fitted with a 9W 5" long Philips (PL-S 9W/10/2P Hg) bulb. The slurry composed of dye solution and catalyst placed in the reactor was stirred magnetically. After photocatalytic treatment, samples were centrifuged (6000 rpm, 10 min) and filtered through a millipore filter (0.45 µm) membrane and analyzed for the concentration of the BB41 in the solution using computer software attached to UV-Vis Spectrophotometer. Photocatalytic degradation processes were performed using a 200 ml solution containing a specified concentration of selected dye. Samples were withdrawn from sample points at certain time intervals and analyzed for decolourization and degradation. Decolourization of dye solutions was checked and controlled by measuring the maximum absorbance of dyes at different time intervals by UV-Vis Spectrophotometer. The maximum absorbance of BB41 in the visible region of UV-Vis spectrum was 608 nm. COD tests were used to assay the mineralization of BB41. The variation of of BB41 with irradiation time is shown in Figure 2. It can be observed that decreasing dye concentration is linearly related to the elapse of irradiation time. This means that the pseudofirst-order kinetics relative to dye is operative. 4) Reaction occurs with both radical and organics in water. Figure 2. Pseudo-first-order decolourization rate of BB41. the intermediates and other reactive oxygen species is not limiting . Table 1. Effect of catalytic loading on photodegradation. decolourization [38-40]. Thus, any further increase of the amount of the catalyst will have no effect on the photodegradation efficiency. 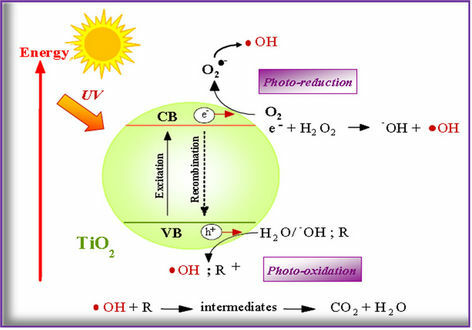 Concentration of TiO2 in the photocatalytic water treatment system affected the overall photocatalysis reaction rate in a true heterogeneous catalytic regime, where the amount of TiO2 is directly proportional to the overall photocatalytic reaction rate . A linear dependency holds until certain extent when the reaction rate starts to aggravate and becomes independent of TiO2 concentration. This is attributed to the geometry and working conditions of the photoreactor where the surface reaction is initiated upon light photon absorption . When the amount of TiO2 increases above a saturation level (leading to a high turbidity state), the light photon absorption coefficient usually decreases radially. However, such a light attenuation over the radial distance could not be well correlated with the Beer-Lambert Law owing to the strong absorption and scattering of light photons by the TiO2 particles . The excess TiO2 particles can create a light screening effect that reduces the surface area of TiO2 being exposed to light illumination and the photocatalytic efficiency. Therefore, any chosen photoreactor should be operated below the saturation level of TiO2 photocatalyst used to avoid excess catalyst and ensure efficient photons absorption. In this sense, both catalyst loading and light scattering effect can be considered as a function of optical path length in the reactor. To study the effect of dye concentration on the rate of decolourization, the BB41 concentrations were varied from 0, 25, 50, 100 & 150 mg·L–1 while the other variables were kept constant. Figure 3. Photocatalytic decolourization of BB41 with different TiO2 loadings at different time intervals of irradiation. Table 2. Effect of dye concentration on photodegradation of BB41. tive to BB41 is operative. However, the apparent decolourization rate constant depends on the initial concentration of dye. As expected by increasing the concentration, the decolourization rate constant (k) decreased. 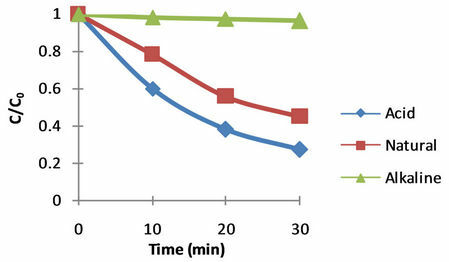 The efficiency of dye degradation decreased with an increase in concentration of dye. The reason presumed is that in high dye concentrations, the active sites are covered with dye ions; subsequently, the production of OHC radicals on the surface of catalyst is reduced. Another possible reason for these results is the effect of UV screening of the own dye. In high dye concentrations a major amount of UV is apt to be absorbed by dye molecules proportional to OH particles and this reduces the efficiency of the catalytic reaction due to the decline in OHC and OH2C concentrations . Another possible reason is the intervention of the by-products formed during the degradation of mother dye molecules . In heterogeneous photocatalytic water system, pH is one of the most important operating parameters that affect the charge on the catalyst particles, size of catalyst aggregates and the positions of conductance and valence bands. Due to the nature of TiO2 catalyst used, any variation in the operating pH is known to affect the isoelectric point or the surface charge of the photocatalyst used. Since dyes can to degrade at different pHs in coloured effluents, comparative experiments were performed at three pH values: one reasonably acidic, one reasonably basic and at the natural pH 5.5 of BB41 (i.e. Natural pH of dye 5.5 ± 2.5). The studies were carried out at pH range 3.0 for the acidic solution and 8.0 for the basic solution. The pH influences the characteristics of the photocatalyst surface charge, so pH of the solution is a significant parameter in performing the reaction on the surface of semiconductor particles. Point of zero charge (PZC) for TiO2 particles is pH PZC = 6.8 . The surface of TiO2 has a positive charge in acidic media (pH < 6.8), so there is an electrostatic absorption between positive charge surfaces of TiO2 and the dye. As the pH of the system increases, the number of surfaces with negative charge increases. Thus, H2SO4 and NaOH were used for pH adjustment of dye solutions. 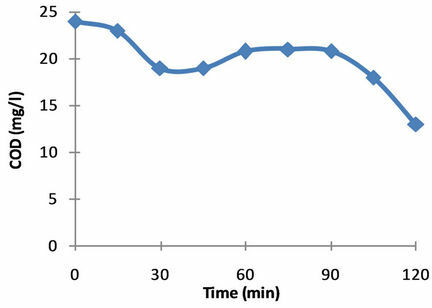 The effect of pH on the degradation of dye is shown in Figure 4. Figure 4. Effect of pH on the photocatalytic decolourization rate of BB41 (C0: initial dye concentration, C: dye concentration at time t). Figure 5. Decrease of COD with irradiation time. COD decreased sharply, reaching a plateau that corresponds to the oxidation of most stable compounds, indicating that almost complete mineralization of intermediates has occurred. 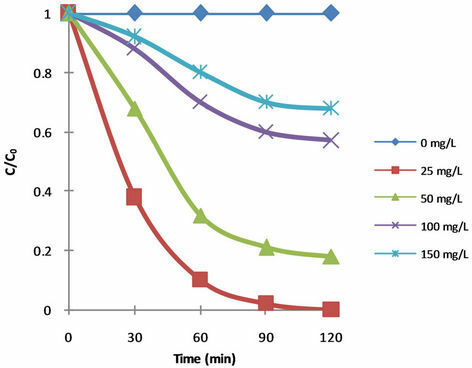 Figure 5 shows variation of COD with irradiation time. The photocatalytic treatment of a textile dye, C. I. Basic Blue 41, from aqueous solution in a photocatalytic reactor was studied. The optimum value of the initial dye concentration was 50 g·L–1 and the operation medium was alkaline. The results of TOC decreased and UV-Vis indicated that photocatalytic process can be used for complete decolorization and mineralization of BB41. M. A. Rauf and S. S. Ashraf, “Application of Advanced Oxidation Processes (AOP) to Dye Degradation—An Overview,” In: A. R. Lang, Ed., Dyes and Pigments: New Research, Nova Science Publishers, Inc., Hauppauge, 2009. A. Giwa, P. O. Nkeonye, K. A. Bello and E. G. Kolawole, “Solar Photocatalytic Degradation of Acid Blue 29,” Journal of the Chemical Society of Nigeria, Vol. 36. No. 1, 2011, pp. 82-89.